With October winding down, I'm running out of time to fit in more last minute Halloween ideas. 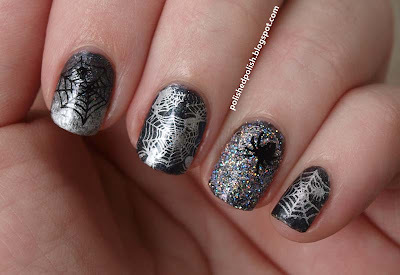 I had to do spiders some time so I went with a skittles manicure to incorporate all the images I own. The base color I used was e.l.f. Metal Madness. It's a dark metallic gray with a subtle holographic glitter. 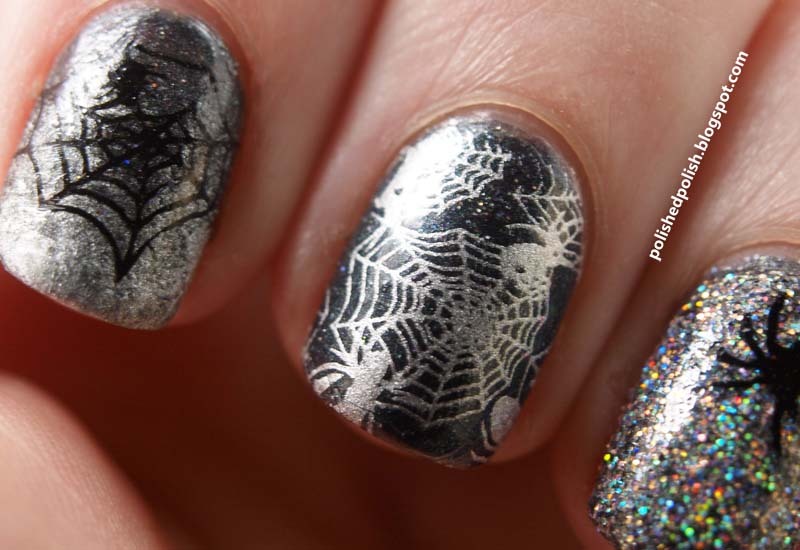 I put too much stuff over the top of it for the glitter to show up on my nails though. The index finger is Silver Sweep sponged on the tip. The ring finger is Fantasy Makers Confetti poured over the top of very wet nail polish and sealed in with a couple of layers of topcoat. I used wax paper underneath so I could put the excess back in the bottle.